For years people (both friends in AZ and credible bloggers) have been telling me that I have to try Pizzeria Bianco, since it’s the “best pizza ever”. Yeah, I’ve heard that many times before, for many places, and usually when someone says a place is that good? It’s usually good, but no Pepe’s, Lombardi’s, or Punch (to name three of my pizza favorites). However, Bianco has gotten a huge amount of buzz, consistently, for years. And Chris Bianco has even gotten a James Beard award. So, for years, I’ve wanted to try this place out. Unfortunately, you don’t just drop in to Pizzeria Bianco. Why? The lines. The place only fits ~40 people, and while they open at 5pm, the line forms well before that (my previous attempt had me showing up at 3:45 pm on a Saturday, and simple math indicated that I wouldn’t even make the second seating). But, this time, I found myself with a free afternoon and evening in Phoenix, so I headed over right at 4:15 pm on a Wednesday night. I The line was definitely starting for form, but, unlike the previous attempt, this time I got right in as they opened, grabbing a seat at the bar (next to Nancy, a regular that all the staff knew). In short, the pizza was everything it had been hyped to be. The crust was nothing short of masterful (Chris Bianco obviously can work miracles with his wood-fired oven). The cheese was perfectly crisped. The toppings flavorful and perfectly cooked. This was about as close to the quintessentially perfect pizza as things get. It actually started with the bread, not the pizza. Since I was dining by myself and planning on consuming an entire pizza, I opted against the delicious-looking appetizers, but decided I needed to try the bread. 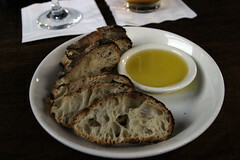 This was some of the best wood-fired bread I’ve ever had. Tender interior. Firm and toothy crust. Nice wood smoke flavor. In short, damn good. For the pizza? I got the “Wiseguy” It’s a white pizza, with smoked mozzarella, fennel sausage (which smelled divine), and roasted onions. These all combined to make one of the very best pizza experiences I’ve ever had, the ingredients simply melting in your mouth in a perfect blend of textures and flavors. The person next to me at the bar, Nancy, is good friends with Chris Bianco, and managed to wheedle a fig, prosciutto, and red onion pizza out of him, despite it not being on the menu. Nancy was nice enough to share a slice with me, and it was phenomenal. The proscuitto was perfectly crispy and salty, nicely pairing with the tender and perfectly caramelized figs. This really, really worked well, almost as good as the wiseguy. My only regret? Not having enough stomach space to try a classic Margherita. 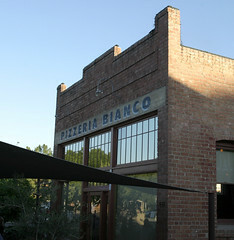 So, in short, at least from my dining experience, Pizzeria Bianco is living up to the hype. It’s funny, I really don’t mind waiting. Especially when the wait takes place in as charming a place as Bianco’s bar. As for commitment to eating at a destination restaurant, I suppose there was a bit of that, though I think it had more to do with the fact that I booked the trip on a bit of a whim . I definitely think, Shokutsu, that you should gather a group of friends together and make a trip out of it! 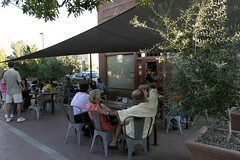 Even if you make your reso, spend some time in that bar..